Interested in a Steel Fence for your Manassas Home? The neighbor to your right has a vinyl fence. The neighbor to your left has a wood fence. And you want your Manassas home to stick out. So why not install a Steel Fence? These fences are coated with an electrostatically applied powder coating to create a durable and long lasting finish that will outperform a painted product. Best of all, your steel fence options are numerous. Steel ornamental comes in an abundance of styles and can even be custom made if you have a unique design in mind. Standard colors are black, white, bronze and dark green. When most people think of a steel fence, they do not think curb appeal. However, these fences are actually some of the most aesthetically appealing on the market. Steel fences stand the test of time. These durable fences, once installed, are rock solid. Unlike wood fences, a steel fence requires very little maintenance. A steel fence also adds value to your home. 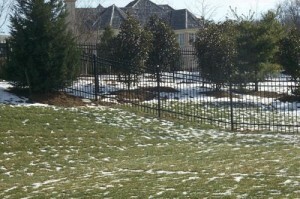 Hercules Fence of Manassas, Virginia can help. Since 1955, we have been providing steel fence installation for the people of Manassas and the surrounding area. Take advantage of more than fifty-five years of fencing experience. Our knowledgeable professional staff can design and install your new steel fence. And we are more than happy to answer any questions you may have. If a steel fence doesn’t tickle your fancy, we have a wide variety of residential fencing options. We take great pride pride in the wide range of options we offer, including Custom Wood Fences, Ornamental Aluminum Fences, PVC Vinyl Fences, Chain Link Fences, and more. Hercules has just what you need. If you have any questions about a Steel Fence for your Manassas Home, please contact Hercules Fence of Northern Virginia today by calling (703) 551-2609 or visiting our website. Also, check out Hercules Fence of Manassas on Facebook, Twitter, Google+ and YouTube! This entry was posted on Wednesday, March 5th, 2014 at 3:42 pm. Both comments and pings are currently closed.